Renee Fleming was nominated as a Distinguished Daughter in 2005. Ms. Fleming, 58, grew up outside Rochester, NY, and attended the Crane School of Music at SUNY Potsdam for a music education degree. Thanks to masterful teachers, she honed her singing skills and acquired a vast knowledge of the mechanics of singing that has aided her career. 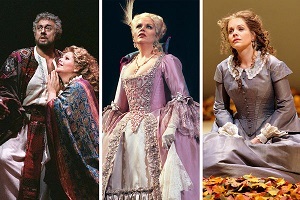 Renée Fleming has performed in multiple operas throughout the years, such as Verdi’s Otello, the title role in Dvorak’s Rusalka, Tatiana in Eugene Onegin and the Marschallin, just to name a few. She has sold over 2 million records, has won 4 Grammy awards, and in 2014 was the first opera singer to perform the National Anthem at the Super Bowl. She has sung David Letterman's Top 10 list, and even recorded (in the original Elvish) some of the songs for the soundtrack of Lord of the Rings: The Return of the King. 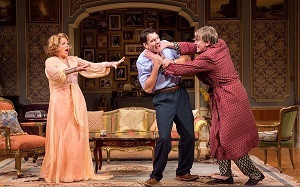 In 2015 she appeared in the play "Living on Love" (pictured) on Broadway. Read the New York Times' enlightening article on Ms. Fleming's brilliant career, but be forewarned: according to an NPR interview she gave shortly after the NYT article came out, Ms. Fleming has no intention of retiring from opera yet, contrary to what the article claims!